Acer has given us here at GameTyrant a wonderful opportunity to test out one of their top of the line ultrawide monitors! The Acer 37.5" XR Curved QHD Gaming Monitor - XR382CQK screams “premium experience” from the moment you unpack the large box. Being a fan of ultrawide monitors, I can tell you I was thrilled to test this monster out! The XR382CQK is part of Acers XR ultrawide lineup of monitors. (XR382CQK is the full model number, but I’ll be calling it “XR” for the rest of the review for the sake of simplicity.) Featuring a 37.5” curved screen with a 21:9 aspect ratio at a resolution of 3840 x 1600 at 75 Hz the XR is a massive monitor! 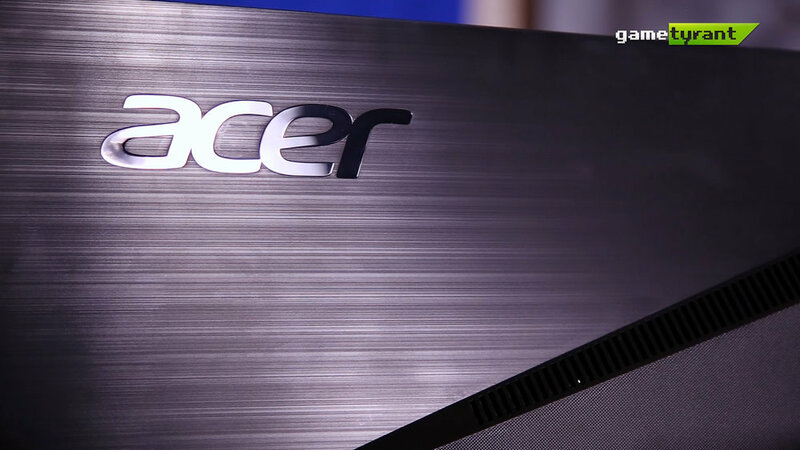 You can view the full techspecs from Acer’s website here. The first thing I did after getting the XR out of the box and hooked up was mess around with its stand. The stand can rotate, tilt and has an adjustable height. I immediately found my sweet spot and booted my desktop. I was overwhelmed by just how encompassing a curved display is even on just my desktop; I was enjoying how much I was sucked into the screen. I have never used a curved monitor before and I can honestly say I am not looking forward to going back to a standard display after this week. After I finally stopped reveling at the beautiful display I decided it was time to put the monitor to work. I normally have a dual monitor setup and the XR quickly proves that it works alone and everyone will like it better that way! 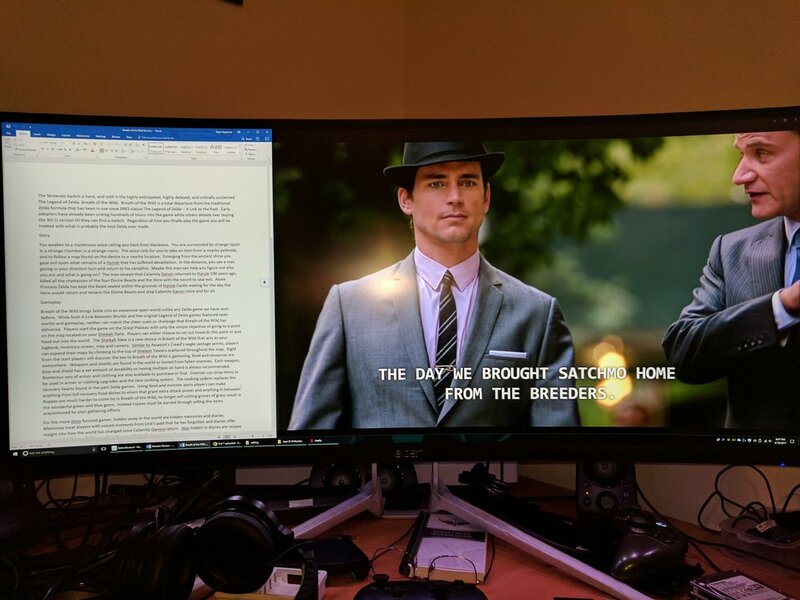 I normally write my GameTyrant reviews on one monitor while having Netflix or Twitch on the other. The XR gave me enough room on a single display to view both on a single monitor with room to spare. Acer advertises that the XR can be viewed from angles up to ~178 degrees. Putting that claim to the test by rotating the screen far to the right so my wife could enjoy watching videos as I worked, I found that even while viewing the XR at extreme angles I could clearly see everything on the screen. Netflix and Zelda review, sounds like a good night! I spent a good chunk of my time with the XR editing videos. Having that much screen real-estate for editing was, in a word, glorious. I could have my editing files, a large preview display, and my timeline stretched across the bottom of the screen for easy editing. Ultrawide monitors are the best way to watch movies. Most digital movies that I own are in their original theatrical aspect ratio which fills a 21:9 monitor with no letterboxing! While I never minded letterboxing it is nice to see a movie without it. Video editing has never been better! Gaming on the XR is how I spent most of my week with this monitor. Gaming in ultrawide is a sight to behold for games that can support 21:9. For any of you RTS or MOBA fans out there, the only way to play the genres is in ultrawide. Third person games take the opportunity to show off more of their backgrounds, giving a more immersive experience. 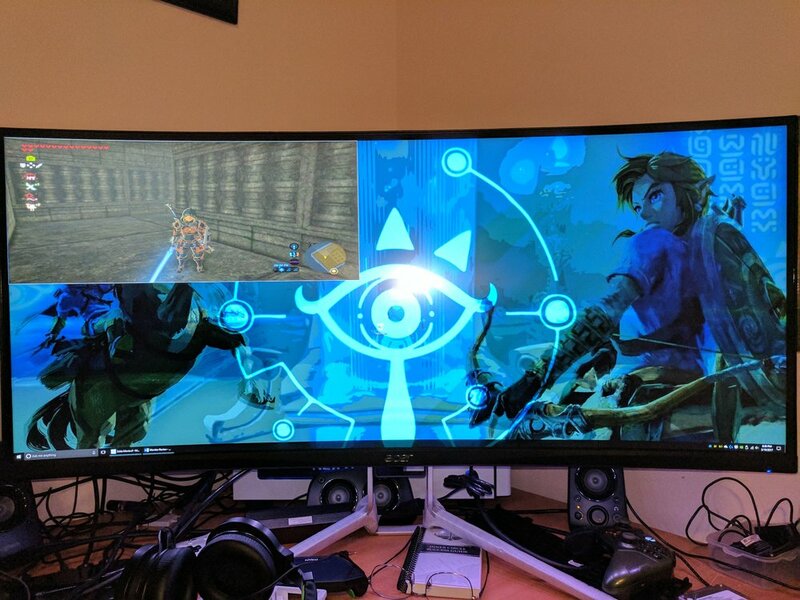 For games and consoles that do not support ultrawide, pillar boxing is applied to the sides of the screen. Even with a 5ms response time I was surprised by how responsive the XR felt. I own a 1ms monitor as my primary display and the entire week I spent with the XR felt the same. Even going back to my normal monitor I felt no difference in response time. You will need a decent computer to fully experience the XR to its fullest gaming potential. With my 980 Ti I could enjoy any game I threw at it at the full 3840x1600 resolution at 60+ FPS. I was unfortunately unable to test out the Free Sync feature of the XR due to not owning an AMD graphics card. The biggest reason for having a dual monitor setup for me is for streaming! One screen runs my game while the other has my streaming software and chat. Because of how big the XR is I was unable to fit a second monitor on my desk. Thankfully with the PiP/PbP modes of the XR I was still able to have a fully functional stream setup! As I said earlier in this review, the XR likes to work alone and proves that it can! When it comes to the con side of the list the XR has nothing major to note. I did experience a couple moments of ghosting while using my Xbox One and PS4 to play games but it hardly happened enough to be a major concern. I love ultrawide monitors! 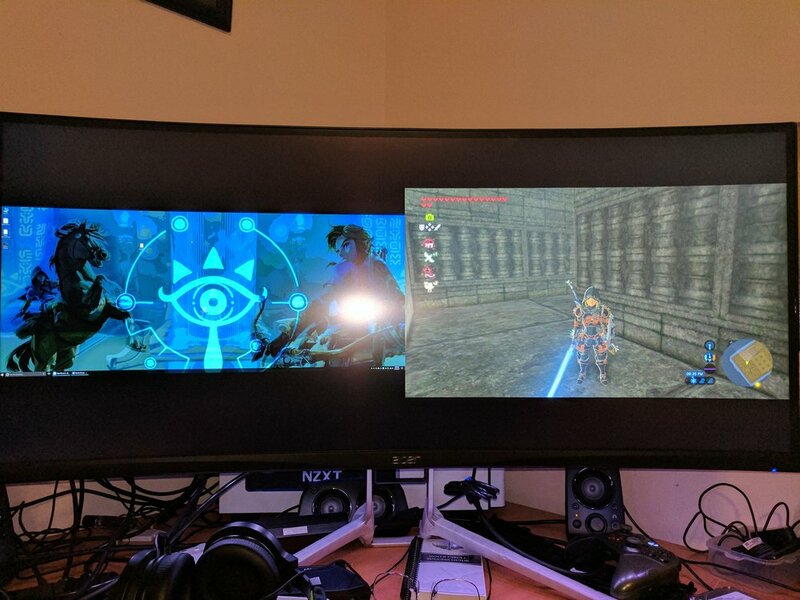 Between being able to watch movies in a proper aspect ratio, great productivity on a single screen, and the truly cinematic views in supported games, nothing beats an ultrawide. 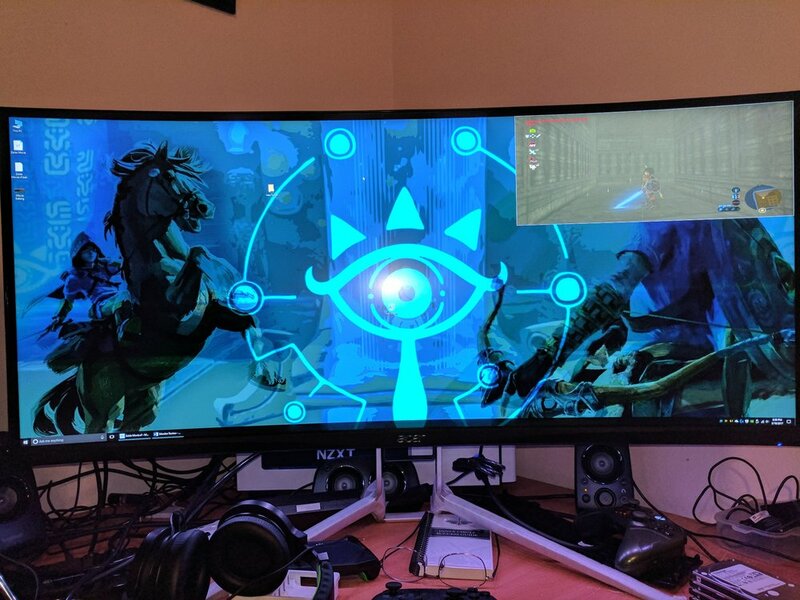 Ultrawide 21:9 monitors are still a niche market segment compared to the standard 16:9 monitors, but hopefully as more people discover how awesome ultrawide monitors are it can begin to grow. The XR382CQK is a top-quality product, right out of the box everything is just good to go. If you own an AMD graphics card I cannot recommend this monitor enough. Even without owning an AMD graphics card I want this monitor to be a permanent fixture for my PC! Thank you Acer for letting me spend a week with the XR382CQK. Now the question is, how soon can I get $1300 to make it permanent? Pixio PX277 Review: A New Challenger Approaches!